who can help choosing a component. I'm building a RF433Mhz node to control wireless powerplugs. The transmitter works fine at 5V but the range is not that great. The transmitter can handle up to 12V, but I have no clue what transitor/fet i can use for both the power line and the data line. Yesterday I tried to use a opto-coupler but that is not fast enough, I clearly see on the scope the signal fading out when going from high to low. I also have some BC547 laying around, but that is inverting the signal, not what i want. Anyone can make some suggestions? @ericvdb If it is the fs1000 type of transmitter I have used those on 12v in the past and just connected the data pin as per normal. Has worked every time for me with no adverse results. 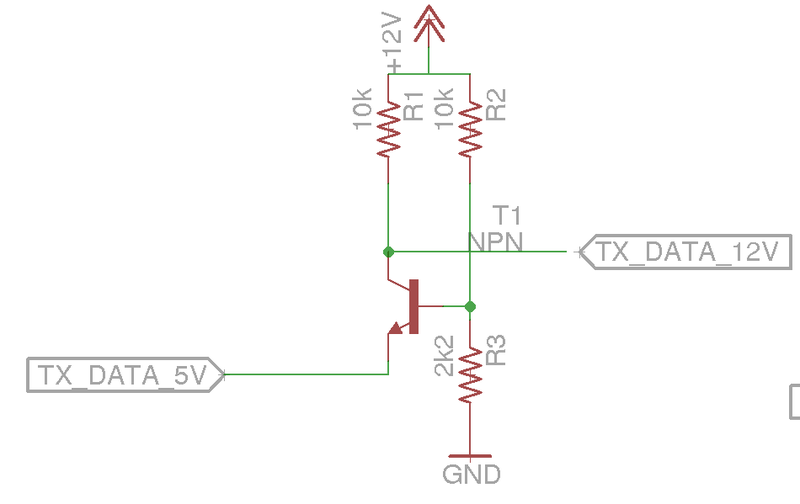 Another option is to use a transmitter that gives full power on 5v. I have used the Dorji RF-DRA887TX transmitters and found them very good. They run on 3.4v to 5.5v, they are a bit more expensive though. Here in Australia they are available from Wiltronics but a google search in your country should give some results for a local supplier. @Boots33 I too have one fs1000 running with 9V on Vcc and 5V data. But the combination of 9V Vcc and 3.3V data (Arduino pro mini) is not working, while 5V Vcc and 3.3V data is working. @TimO I have never tried with a 3.3v arduino, interesting that it will not work. @Boots33 no, it's not the FS1000 type, but a regular cheap RF433 transmitter. The problem is that when powered with 12V, the transmitter does not see the 5V on the data pin as high. Then maybe you can try on 9v as @TimO has suggested, this may be close enough to register the highs and still give you the range boost needed. Otherwise it would seem you will need some form of line level shift circuit as @dbemowsk has shown.